With the massive target of the National Solar Mission of 2022 looming large, the Government of India is going the extra mile to make energy consumers switch to solar PV power by providing financial rebates to the early movers, even though solar power is already financially viable for a lot of energy consumers in India. One such notable step in the direction has been the 500 MW rooftop Grid-connected Solar PV Rooftop Tender by Solar Energy Corporation of India (SECI). 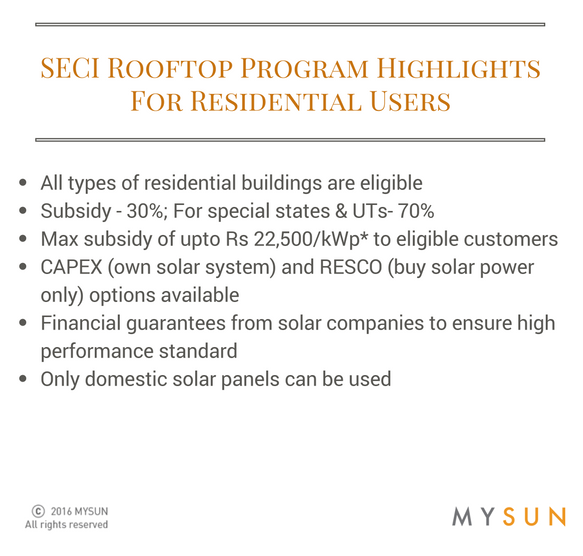 According to the SECI rooftop tender, a select category of energy customers across India can avail about 30% subsidy on the solar system cost. Some special states such as North Eastern States, Uttarakhand, Himachal Pradesh, Jammu & Kashmir, Lakshadweep and Andaman & Nicobar islands, etc. are eligible for up to 70% subsidy. In addition to that, the consumers also get 5 years of operations and maintenance free of cost. The eligible consumers for this subsidy are independent house owners, housing societies, schools, colleges, temples, hospitals, etc.. 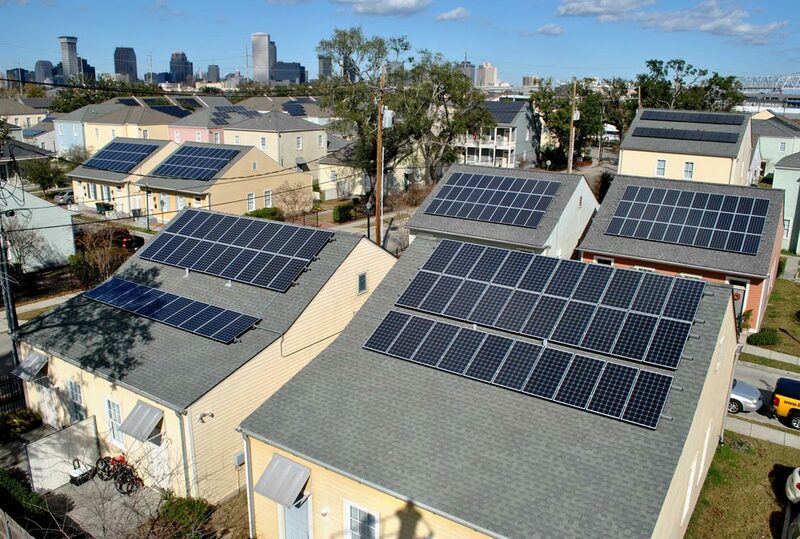 Therefore, if you are planning to take your home solar or happen to be running an educational institution or a hospital, you can benefit massively from this program, which is open to all 29 states and Union Territories. 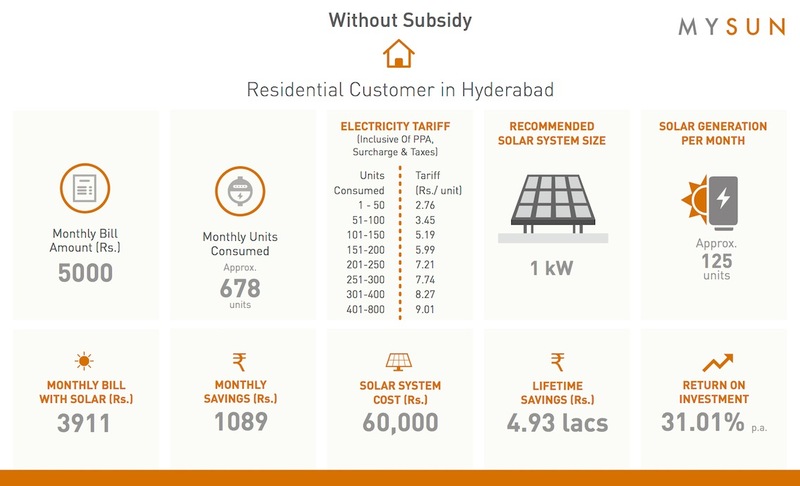 While we have explained the rooftop solar subsidy for social and institutional consumers on our blog, here is how the residential users, individual houses, housing societies and RWAs can hugely benefit from this subsidy and substantially reduce their electricity bills while at the same time contribute to the environment and give a green environment to their families and the community at large. If you like to do your Math, you would have by now run the MYSUN Solar Calculator and would have got your personalized Solar Scorecard. 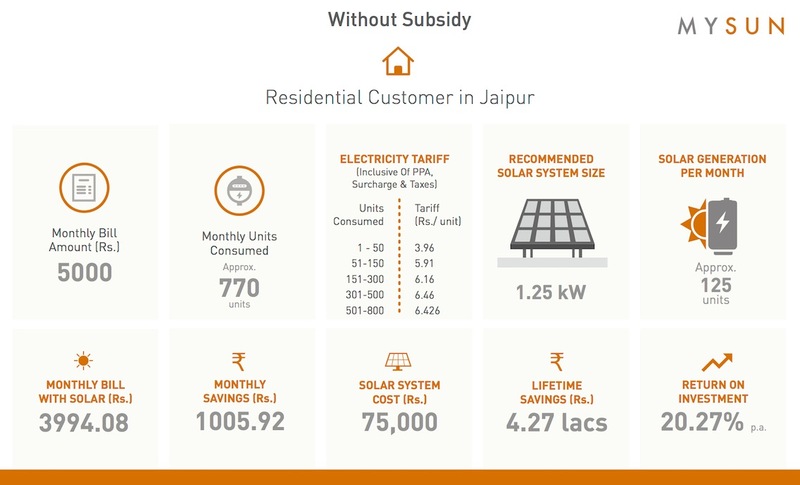 Countless electricity consumers who have run the MYSUN Solar Calculator across India have already reported huge potential energy savings and Return on Investment (ROI) in the range of 16~24% on their investment in rooftop solar PV panels. With the prospect of this additional 30% subsidy on solar power rooftop panels/ systems, going solar now is like a once-in-a-lifetime opportunity for you. 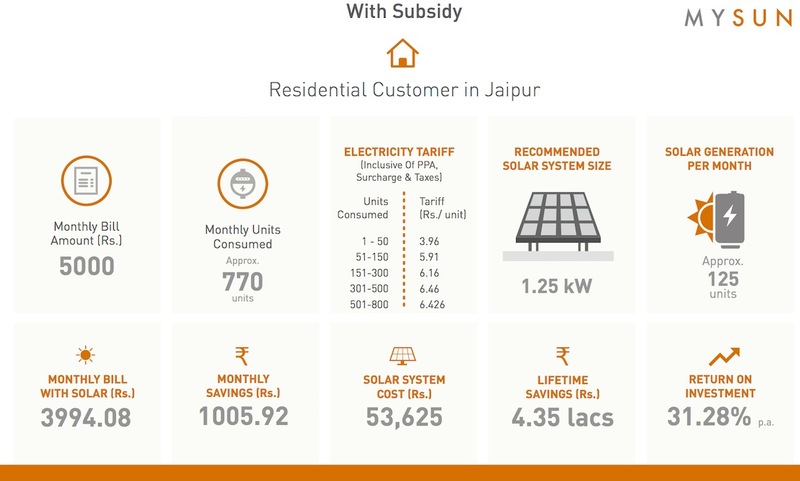 Just to quote an example, a solar system available for INR 60,000 per kW in Delhi can be obtained for Rs 40,000 under this subsidy. You can check your personalized and fairly accurate savings potential and system cost in a rather detailed fashion by running the MYSUN Solar Calculator that gives you a snapshot of your solarisation potential here. For a more detailed look at the state-wise allocation and solar power system subsidy in your state, you can view the list here. Moreover, there are additional benefits and you can check all the details with regards to the solar policy in your state by clicking here. Let’s try and elucidate our point by taking say an example of two more cities - Hyderabad and Jaipur. 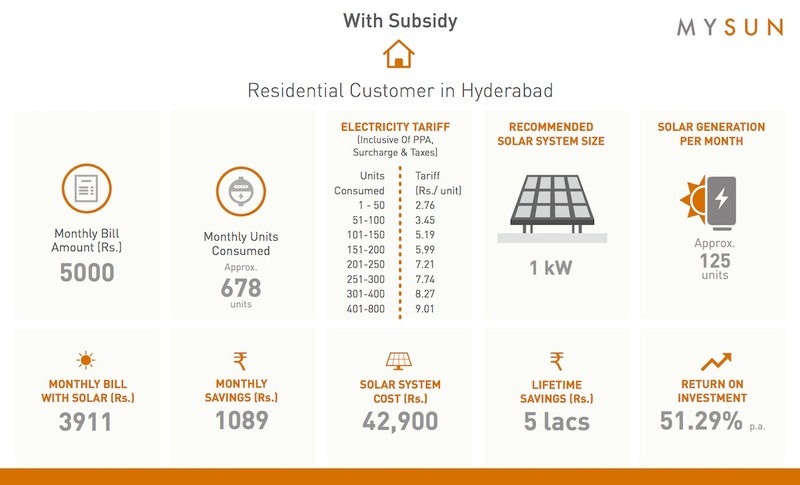 Below you will see the solarization benefits for a typical residential energy consumer living in Hyderabad and Jaipur respectively. SECI has enabled both, CAPEX(show) and RESCO(show) ownership models for systems, making the choice of ownership simpler. Moreover, you can also avail of the Net-metering facility in your state and your solar installer will help you get all the approvals for the same. Given that this is a limited time scheme, we urge you to make your decision fast and Register your Rooftop with MYSUN immediately. Remember, the early bird gets the worm. As your solar enabler and an unbiased marketplace, MYSUN ensures that you get the most competitive quotes from a number of reliable solar installers near you. We promise to simplify solar for you, answer all your queries and doubts about solar power and to be there throughout your solar journey. Once you are on the MYSUN platform, we ensure that you get the best quotes from our list of pre-screened installers and developers who deliver you high quality solar systems adhering to MYSUN standards on quality, pricing, solar system design and engineering, maintenance, etc.. If you want to check the financing or loan options, you don’t need to look beyond MYSUN who has tied-up with several banks and financial institutes that help you with the right financial product. For the next 25 years, you can bank upon our team for complete support and assistance. We are literally an E-Mail or a phone call away, and you can find all those details right on our contact us page. Arpit, We are winners of this SECI contract as well. Please let me know if you would like to collaborate with us. We have total 10 MW in Part A as well as Part C. Please call me at 9711794449 incase of any questions. Congratulations! Indeed we would be delighted to collaborate as a partner with you. We will be in touch with you shortly. Hi Arpit, we would like to discuss in detailed about collaboration. Please let me know your contact no. or you can send me mail. I have dropped an Email to your provided ID.